Synergy Building in The Chapel Hill News! Check out the article in The Chapel Hill News, September 27, 2009, on the front page of the Real Estate section. Correspondent, Sally Keeney, has written a wonderful article about Tom Howlett's new house. If you’ve ever tasted the mango salsa at Flying Burrito in Chapel Hill, then you know the intensity of flavors is matched only by the colors of mango chunks against fresh cilantro and sun-drenched tomatoes. I had the same sensation when I stepped inside the southwestern/Mexican- inspired house of Tom Howlett. Wow! The great room pops with mango yellow walls, sun-dried tomato counters and an etched concrete floor with sunset swirls thanks to Chris Maestro of Classic Concrete Designs. Turquoise, sand-stone and adobe reds color the walls of bedrooms and baths. The interior colors are all the more intense against the pale gray stucco exterior. Up the gravel driveway, tumbled glass serves as mulch in the xeroscape garden beds designed by Jonah Roberts of Lael Landscapes of Raleigh. Vines will soon cover the back patio pergola, providing shade in summer and sun in winter. A bank of wild flowers, drought-resistant plantings and ground covers will make “mowing the grass” somebody else’s problem, because there won’t be any at Howlett’s hacienda under the oaks. “The whole idea of this house is ‘small is beautiful”, said Howlett, who is co-owner of Synergy Building Co. “My dominating intention is to keep the costs low and build this as affordably as I can”. Howlett’s company has built many affordable homes for Orange County’s Community Home Trust. Cost savings on his own hacienda began with its size – 1800 square feet instead of the average 2,629-square-foot house being built in the second quarter of 2008, according to the U.S. Census Bureau. The one-story, three-bedroom/two-bath house has a passive solar design and south-facing orientation. The house has 9-foot, 4-inch high ceilings, wide exterior overhangs to minimize heat gain in summer, and a sealed attic with Icynene spray foam on the roof deck. The long-run savings will be in energy use. 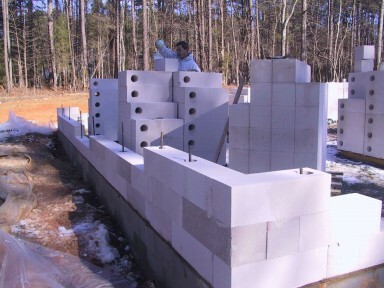 Howlett chose a radiant heat slab on grade instead of a crawl space and Autoclaved Aerated Concrete block as his building material. AAC is a lightweight, precast concrete building material (sometimes called Autoclaved Cellular Concrete or ACC). It is one-fourth the weight of conventional concrete and superior as a thermal and acoustic insulator. It is also fire and termite resistant. Howlett calculated his home’s AAC walls installed cost just under $7 per square foot ($9 if the square footage of windows and doors are deducted). Those prices include the cost of the block, labor, special thinset mortar, steel rebar and concrete (used to fill the core block and bond beams as well as the final top U-block course). AAC is unlike many other concrete products because it can be shaped using conventional carpentry tools. But don’t let its light weight and versatility fool you. Anybody who wants to build an AAC block house should have experienced masons do it, Howlett cautions. “It is a little tricky to do it right”, Howlett says. 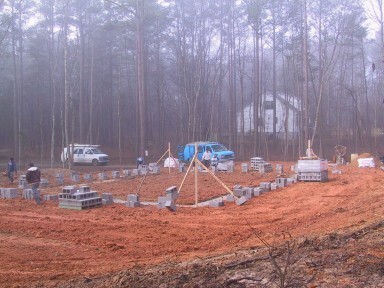 For a step-by-step look at his house as it was being built, log onto www.synergybuilding.com and click on “ Energy Efficient home, AAC block” at the bottom of the screen. Howlett used stucco on his exterior walls and drywall on the interior. “We glued and screwed the sheetrock to the block”, Howlett explained. Then, instead of typical straight-edged metal corner beading, Howlett used plastic, rounded, bull nose edge beading which gives arches, doors and window (check out these guys for fixing broken dual pane window glass) ledges that soft, southwestern look. With that in mind, Howlett negotiated costs whenever possible. He says he saved at least $4,000 by choosing less expensive double-hung insulated glass windows. He also minimized glazing on windows on the north side of the house where weather isn’t as intense as other exposures. He installed a truss roof instead of a stick-frame roof, which saved him about 20 percent of the roof cost. He chose 30-year architectural shingles as opposed to a metal roof, saving another $7,000. The bathroom is an important room for Howlett. “I call it my de-stress room,” he said. “I have learned over the years – just a good long soak in the tub relaxes me completely.” He’ll smile every time he turns on the water and thinks about how he found a beautiful spout for his soaking tub at the Habitat Re-use Store. The spout cost $45 and had a few missing parts that he bought for $100 at Wilkinson Supply in Carrboro. Retail, the spout would cost $550, he said. He also recycled beautiful wood kitchen cabinetry from the Re-use Store and had cabinet makers match fillers where needed. He found granite remnants for vanity tops. Eventually the radiant slab heat will be backed up by solar, but he has deferred building solar collectors ($6,000 savings) and a detached carport. The house is all-electric because natural gas lines don’t run to his property and he doesn’t want the expense of propane. Despite these cost-saving measures, creating a small house that lives big, green and easy, has cost Howlett $200,000-plus so far, and that doesn’t count his time as general contractor. 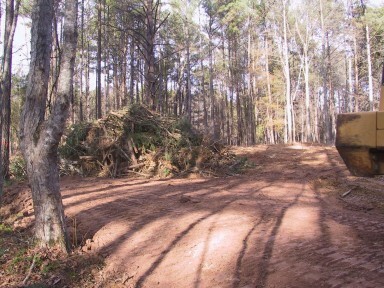 Nor does it include the extra landscaping elements he and Roberts have planned. Eventually Howlett wants to distract mosquitoes by berming and back-filling an area to create a running waterfall using recycled water. But until then, there’s always the soaking tub for relaxation.